A new crop picture at Newton Barrow on June 15, 2015 shows many remarkable features, so as to preclude any chance of local human fakery. 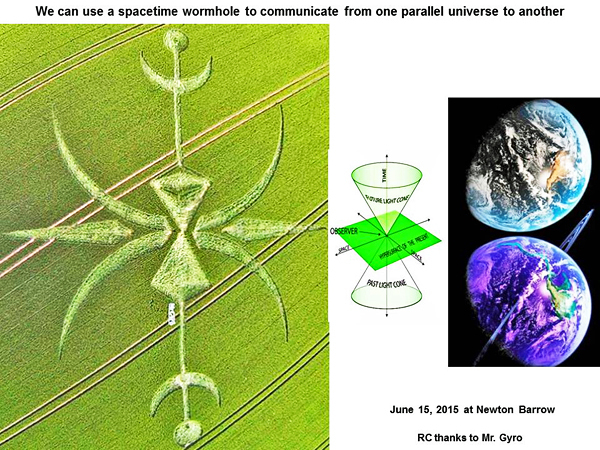 Details of this crop picture also suggest “communication by a spacetime wormhole” from another “mirror universe” into our own. Video images of the new crop picture at Newton Barrow may be seen here (see www.youtube.com). Such images are worth a careful study, by anyone with even the slightest interest in scientific matters! How can you live on planet Earth today, with all of its wonderful electronic communications, yet choose not to “see”? 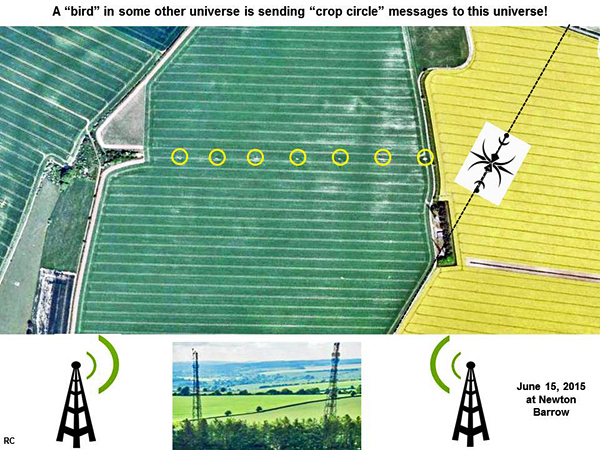 The Newton Barrow crop picture was drawn close to two radio towers, which are used for mobile telephone communications. It points almost directly towards them (but not exactly, please see below). In 2002 at Crabwood, they called such devices “conduits”, because they create a narrow passage or “pipe” through space and time, through which other objects and/or energies may flow (see time2007n). That “kite” geometry describes a 60o-60o-60o equilateral triangle, which is joined on one of its three sides to a 30o-120o-30o isosceles triangle. The overall space inside of both “joined triangles” is then filled with an inscribed circle. That is where we can see the crop image of a “face”. Such a clever detail suggests that the crop artists may soon be “flying” to come and see us! Their “wormhole” or “double kite” shape may also be described as a “hyperboloid”. Some people have suggested that the centre of this crop picture resembles an “egg timer” or “sand hourglass”. By that hypothesis, not much time may be left until those visitors actually arrive on Earth. If any interested readers would like to download the slide just shown above, then flip it over by 180o, then they can see more clearly a “sand hourglass” shape: with no sand left at the top, or practically all sand down near the bottom. Other people have compared the two large “crescent” shapes from this crop picture to the semi-circular path of a pendulum weight in a “pendulum clock”, as time passes. How much time still remains? 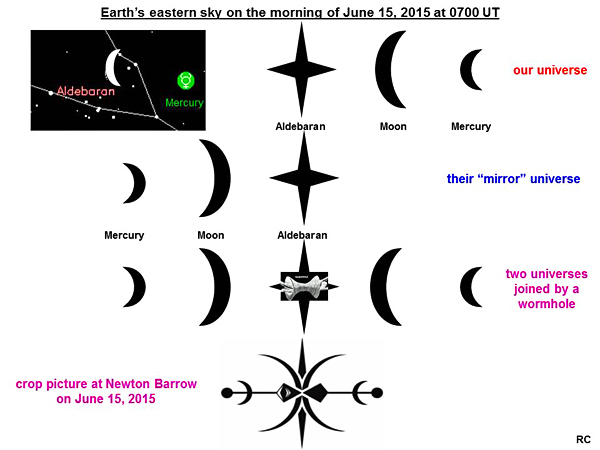 This new crop picture was drawn in a field just before the new Moon of June 16, 2015, and at the same time as when a large crescent Moon occulted a small crescent Mercury on June 15, 2015 at 0200 UT: images of our morning sky from a “mirror universe”? Also on June 15, 2015 at 0200 UT (very close in time to when the Newton Barrow crop picture appeared), our Moon as a “large crescent” occulted planet Mercury as a “small crescent” in Earth’s morning sky. Both astronomical crescents, large or small, pointed in the same direction toward the bright glare of our Sun, which was not far away. Two different versions of Earth’s sky, each a mirror image of one another, could be joined by a “spacetime wormhole” in the very centre, so that an unseen crop artist (living in his “mirror universe”) would be able to see “both sides”, and thereby draw the entire image as shown. There have been many other crop pictures in the past which suggest a “mirror universe”, but this is the first lucid example from 2015. One can hardly fail to think here of a “universe window” from the science-fiction TV series “Fringe” (see www.youtube.com), or a visit by “Olivia Dunham” (Anna Torv) to that alternate universe, where actor Leonard Nimoy played a key role as “William Bell” (see www.youtube.com). 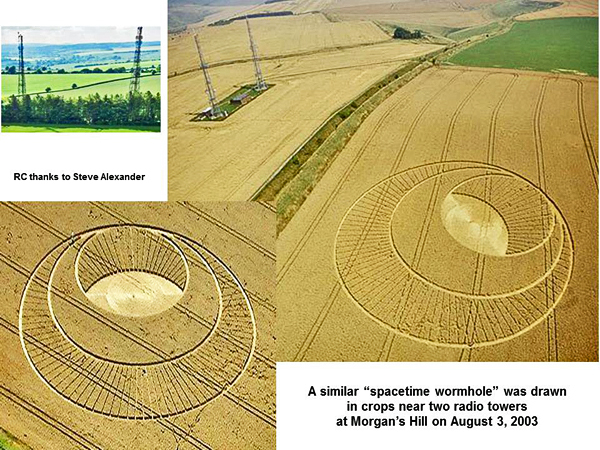 Is this a possible answer to the long-standing crop-circle mystery One would think so. Another crop picture with similar features to Newton Barrow was drawn at Allington on July 29, 2012 (see allington2012b). Those crop artists seem to be communicating basic ideas of geometry which both of our cultures, theirs and ours, would easily be able to understand, if the scientists here on Earth would simply “open their eyes and look”. Practically every crop picture in the summer of 2015 (so far) has shown distinctive and clever geometrical features, with regard to its field location and orientation. 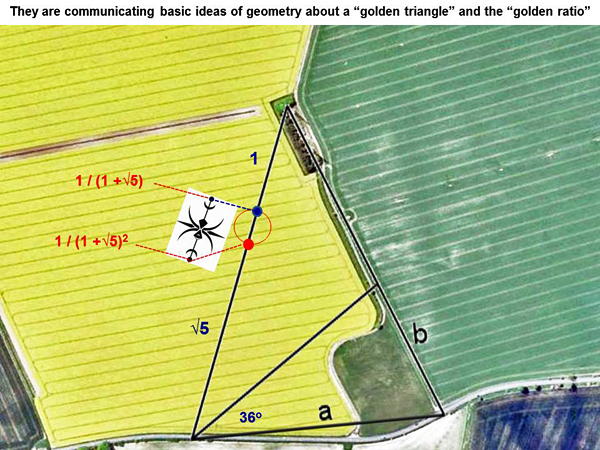 When attempting to analyse such geometrical features at Newton Barrow, first we found that a “golden triangle” could accurately describe many features of the landscape nearby. A “golden triangle” has two isosceles edges of relative length (1 + √5), and a base edge of relative length “2” (see Golden_triangle_(mathematics) ). Next we measured carefully with a ruler, to determine where along its left-hand triangular edge of length (1 + √5), the new crop picture had been drawn? It turns out that the first “flattened dot” which begins this crop picture (marked with a “blue dot” in the slide above) was drawn where the number “1” joins to the number “√5” along its left-hand edge. In other words, it was drawn 1 / (1 + √5) of the way along the left-hand edge of a “golden triangle”. A second “flattened dot” which ends this crop picture (marked with a “red dot”) was drawn a little further along on the same edge, just 1 / (1 + √5)2 further down. In order to make these complex mathematical relations more clear, let us explain them in very simple terms. Thus if the entire length of that left-hand triangular edge were adjusted to 324 mm on your computer screen, then a “red dot” which begins the crop picture would be drawn 100 mm along the left-hand edge, while a “blue dot” which ends the crop picture would be drawn 31 mm further along. In this case, a total length of the left-hand triangular edge as “324” matches 3.24 as (1 + √5) for a “golden triangle”. Likewise a distance from the top of that triangle to the “blue dot” as “100” matches 1.00 = 3.24 / (1 + √5). A slight further distance down to the “red dot” as “31” matches 0.31 = 3.24 / (1 + √5)2. We were able to recognize a “golden ratio” for field layout of this new crop picture at Newton Barrow fairly easily, because a similar scheme had been used at Nettle Hill on August 16, 2014 (see www.youtube.com or www.youtube.com). There the distance of a “seeing eye” crop picture to a nearby tree, versus to an external flattened circle in the crop nearby, were based on a “golden ratio”. Several features internal to the Nettle Hill crop picture were also based on a “golden ratio”. 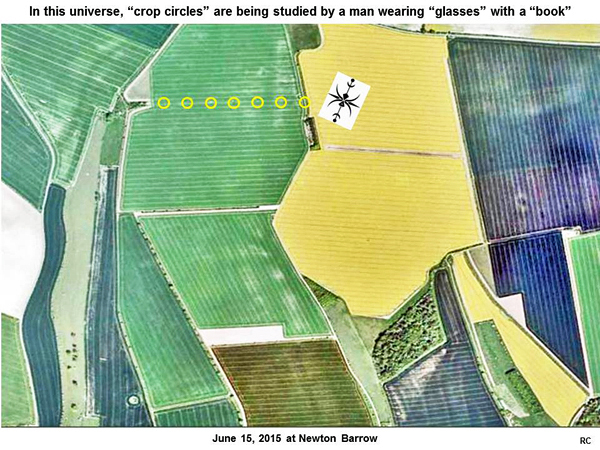 Two internal features of the new crop picture at Newton Barrow likewise seem to be based on a “golden ratio”. These would appear to be, after careful measurement with a ruler: (i) a relative distance from either “outer dot” (left or right) to either “small crescent”, versus the distance to either edge of a “wormhole” in the centre, and (ii) the relative sizes of large versus small “crescent” shapes. The “outer dot” on one end of Newton Barrow shows a “donut” shape, while its “outer dot” on the other end shows a simple standing tuft. This crop picture shows “mirror plane” symmetry (almost), so we could “fold” one half of the crop picture over onto the other half, while fitting that standing tuft into a small hole made by the “donut”, and still retain the same pattern. The right-hand edge of its “golden triangle” likewise seems to show spacings close to a “golden ratio”, if we measure the distance between each of two radio towers, versus a length for the right-hand edge down to line segment “b” (shown in the slide above). A landscape “bird” is humorously “blowing crop circles” in our direction! The crop picture appeared just above two radio towers on the right. Each of those small “yellow circles” in the slide above marks a tall tower for electricity supply. A “man” who wears glasses and reads a book: who could he be? This humorous image might describe many scholarly, educated people on Earth today! The landscape “man” looks completely dumbfounded, while the landscape “bird” continues to “blow crop circles” in his direction. “What could they be? What is happening here?” the confused man seems to be thinking. We can see 7 yellow circles in a field between the “man” and that “bird”. So far during the spring or summer of 2015, there have been 7 major crop pictures in England (not counting an early, trivial image on April 9). This new crop picture was drawn at latitude 51.118 North, 1.853 West, if the reader wishes to study its landscape features further? With a little imagination, we can see in the landscape a “dog wearing glasses”, or alternatively a “horse” (when the “dog” is flipped over), or even a “serpent king” with a man’s face, plus two numbers “1” and “5”. 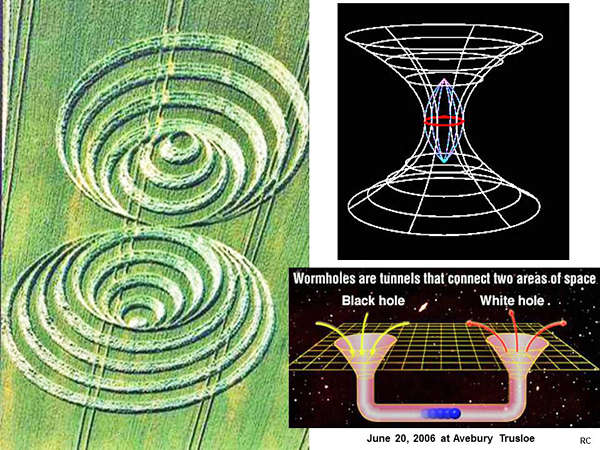 Such a wormhole configuration is thought to permit “time travel”, or even “travel from one universe to another”. 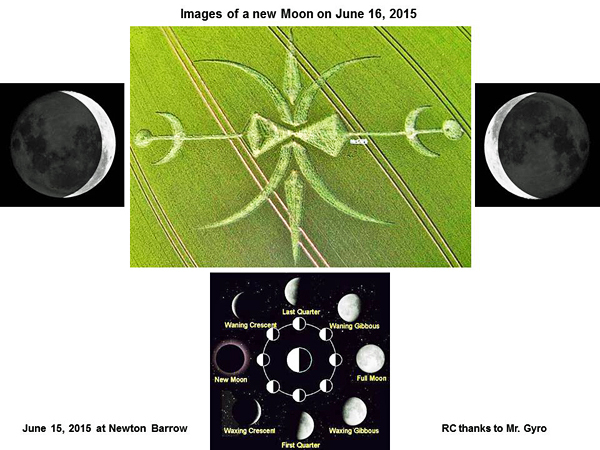 This field image from 2003 seems similar in meaning to the new crop picture at Newton Barrow on June 15, 2015. 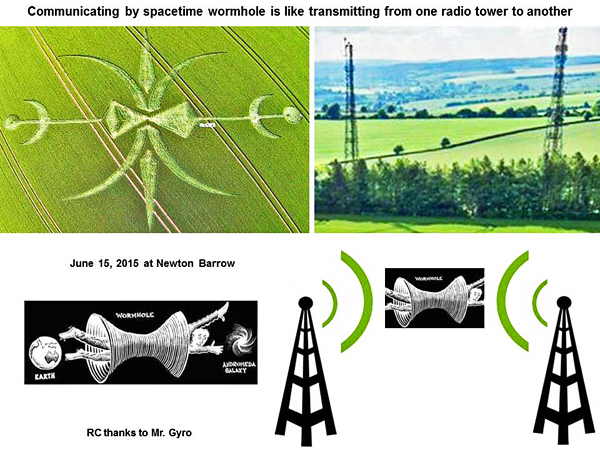 In both cases, the crop artist is suggesting a common metaphor, which compares “communication between one universe and another” using spacetime wormholes, to “transmitting a message between two radio towers here on Earth”. Although we may be unable to understand these beautiful field images in every detail, nevertheless we can make a reasonable appraisal of their overall meanings and intent. 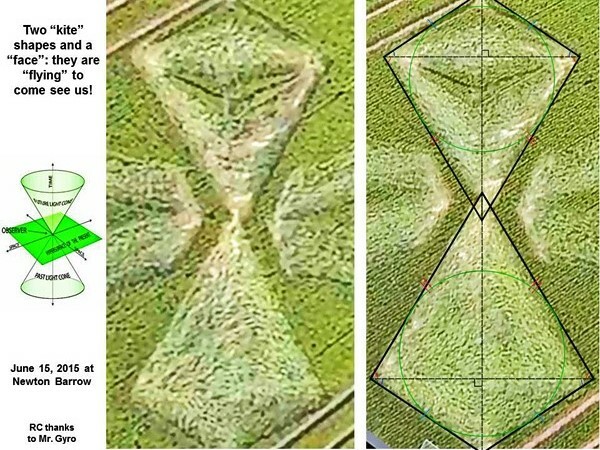 “Crop circles” are real, and the “bird” is going to keep “blowing” them in our direction, however long it may take for confused humans on “our” Earth to catch onto the astonishing reality of a “mirror universe”. P.S. We would like to thank Mr. Gyro for his excellent drone video of the new crop picture, as cited above. 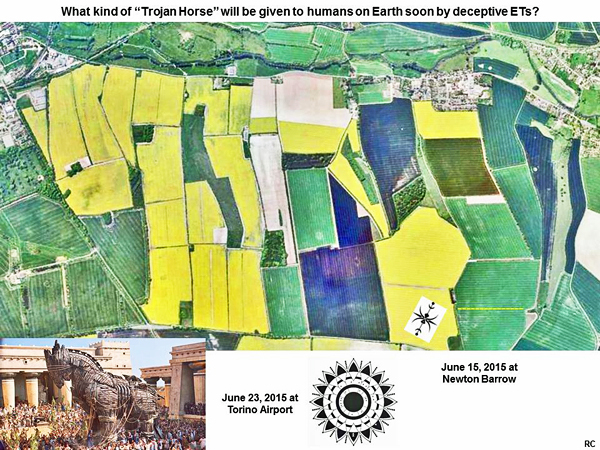 Another crop picture in Berlin, Germany on July 7, 2015 showed the clear and lucid image of a “Trojan Horse” in landscape nearby. 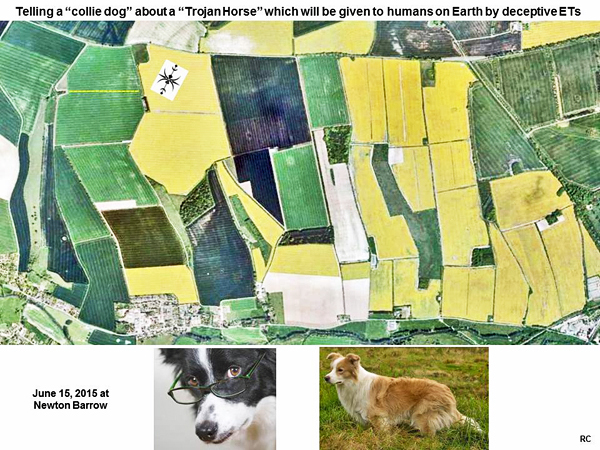 Thus we have been warned now (as of July 11) about a modern “Trojan Horse” three times in crops. All of this seems rather amazing, even if cryptic. What might be the exact nature of that “Trojan Horse”, which will be supposedly given to humans on Earth, by deceptive extra-terrestrials in the near future? Are the crop artists time-travellers? They apparently planned their June 23 crop picture in Italy, in advance of the fact by eight or more days, and had it ready by June 15. Do the crop artists know who we are in specific human terms? Certainly all serious researchers on Earth are waiting for more answers to be given by that mysterious “bird”, who drew the crop picture at Newton Barrow on June 15, 2015.